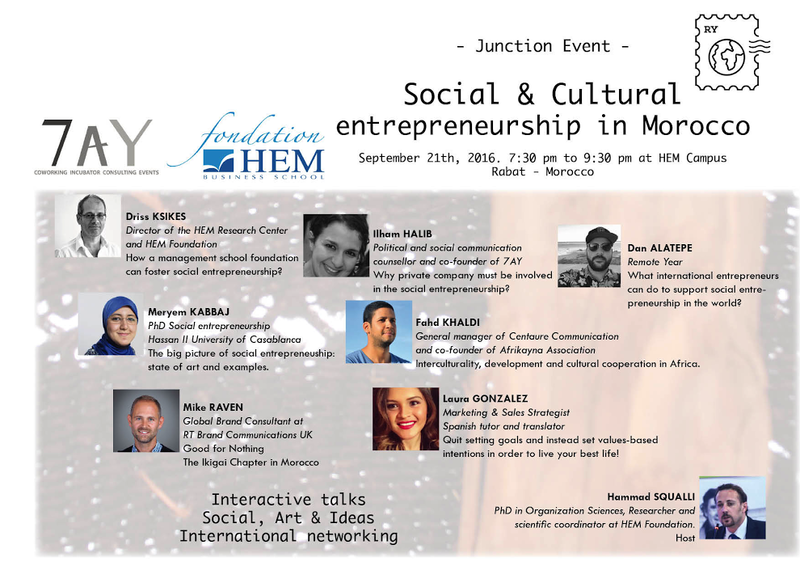 Join 7AY coworking & incubator and the HEM Foundation for the Remote Year "Junction Event" on Social and Cultural Entrepreneurship in Morocco. Remote Year brings together a community of 75 digital nomads from across the globe to spend a year working, traveling, and exploring 12 cities around the world. Spending one month in each location, the community will connect with local cultures and business ecosystems, forming lifelong, borderless personal and professional relationships along the way. 7AY is the coworking and incubator space to know in Rabat aiming to improve business capabilities reaching out a great community to share skills, dreams and achievements. The HEM Foundation for the development of managerial education, culture and research is involved in training successful, change-driven future leaders imbued with a spirit of active citizenship and committed for the emergence of a successful, just and interdependent society.